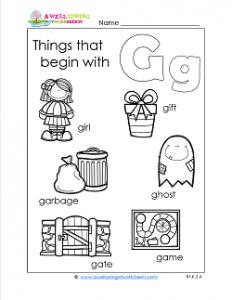 This is a great selection of things that begin with g. Just a note: all the objects pictured on this worksheet have the hard g sound. The pictures (and words) are of a girl, a ghost, garbage, a gate, a gift, and a game. Hopefully, your kids have fun “reading” the words and sounding out the letter g. /G/ /G/ Great fun for you and your kids. Perfect for familiarizing kids with the concept that words start with specific letter sounds. Don’t forget to color the pictures!